Home > Annual Spring Auction! 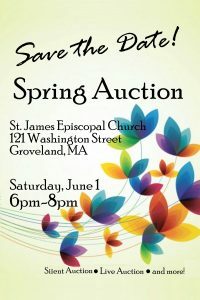 St. James Episcopal Church Annual Spring Auction! This annual fundraiser is a fun event! We will once again have some amazing live and silent auction items. f you are looking to donate a special item to this auction, please complete a donation form. To download a copy , please click on this donation form link: Auction Donation form. The deadline for donations is Thursday, May 30th, during office hours. Thank you!! !